Sometimes I try to do too much. At times, it can be by choice. 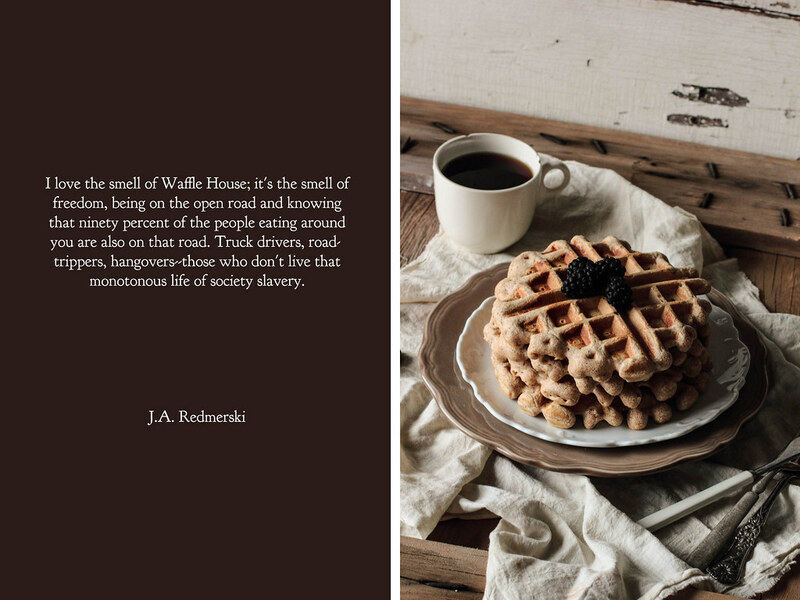 It's not unusual for me to stay up late to type out a few paragraphs of a story I want to share with you. On most occasions, however, I do too much out of necessity. It comes with the territory of managing being a full-time student and juggling two part-time jobs. When I'm not buried in a textbook or typing up an essay, I'm neglecting the household chores, allowing the dirty dishes to pile up in the sink and the dust to settle on the end tables. The balance in my life is missing. I'm not sure when the balance began to teeter or when it plans to return, but I do hope it happens soon. I feel like "trying to do too much" seems to be the motto for many people. We may not always have our sanity, but at least we have solidarity. During times of stress, I often forget that it's important to take time to enjoy the small moments. These moments may not feel significant in the grand scheme of things, but in the present they are a soothing presence. The scent of the change of the seasons blowing in the wind. Singing along when my favorite song comes on the car's radio. Leftovers waiting in the refrigerator after an evening of working late. The beauty harbored in a light morning rain. I woke up to dim skies and the sound of rain beating against the sidewalk. It was a quiet morning, somehow made quieter by the steady music outside the window. I could have had a bowl of cereal and settled into a morning of work, but I refrained. Morning rain can be rarity in the Midwest; it felt shameful not to take the time to revel in nature's languid drizzle. I turned on the oven and made a batch of scones. 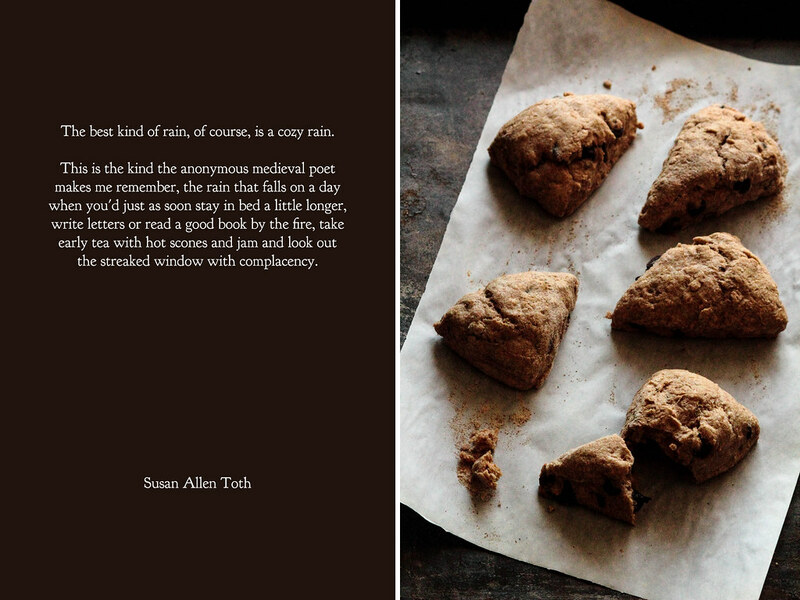 The scones weren't complicated or elaborate; they were rustic, with rough edges and imprecise cuts. I didn't need them to be perfect. They just needed to be honest. 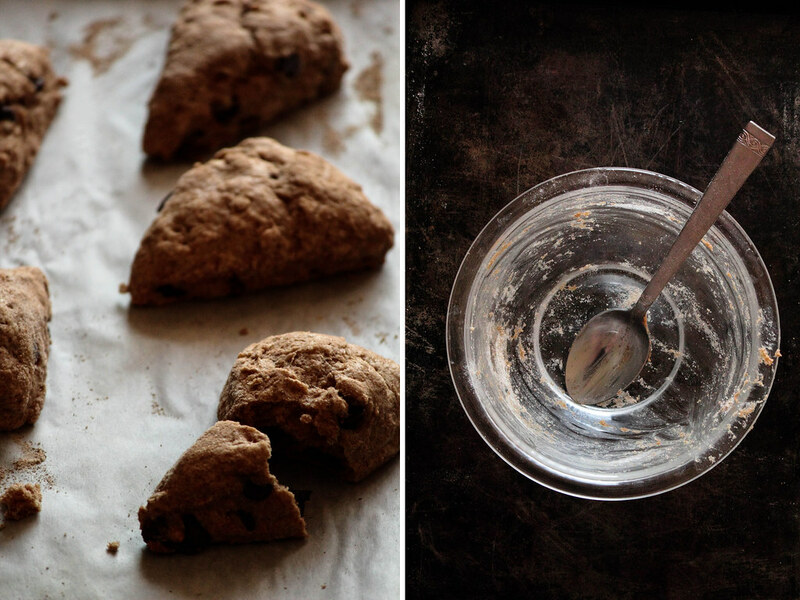 I savored a scone in the cloudiness of the morning, taking my time to enjoy the softness of each bite, before cracking open a textbook and starting another day. The moment may have been small, but it was exactly what I needed. 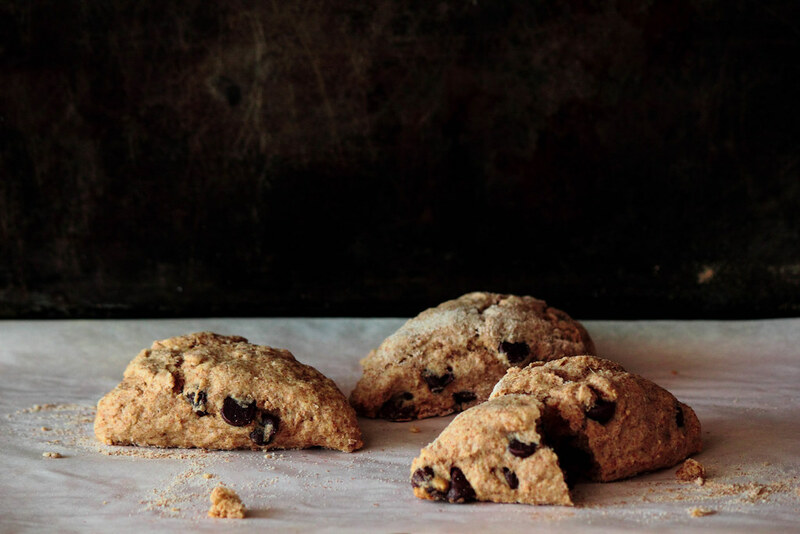 Whole Wheat Chocolate Chip Scones are simple and unpretentious. 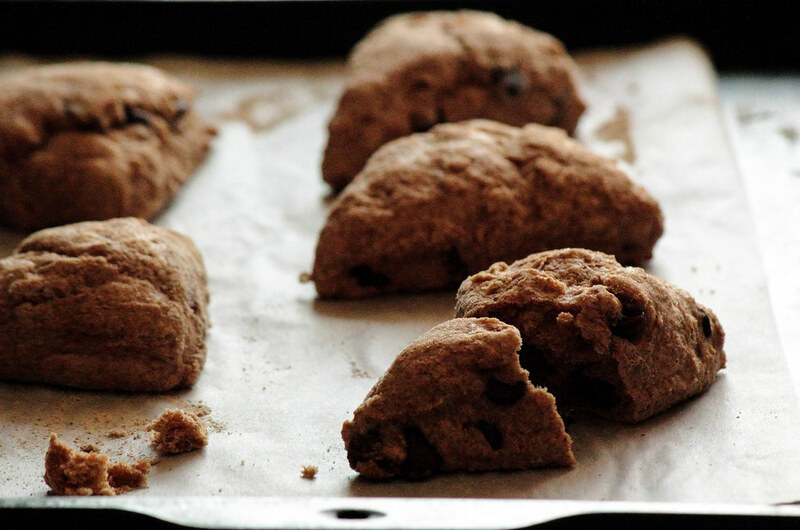 The scones come together easily with a little butter, a little cream, and whole wheat flour to add a more robust flavor. The scones are not terribly sweet, but I don't think they need to be. 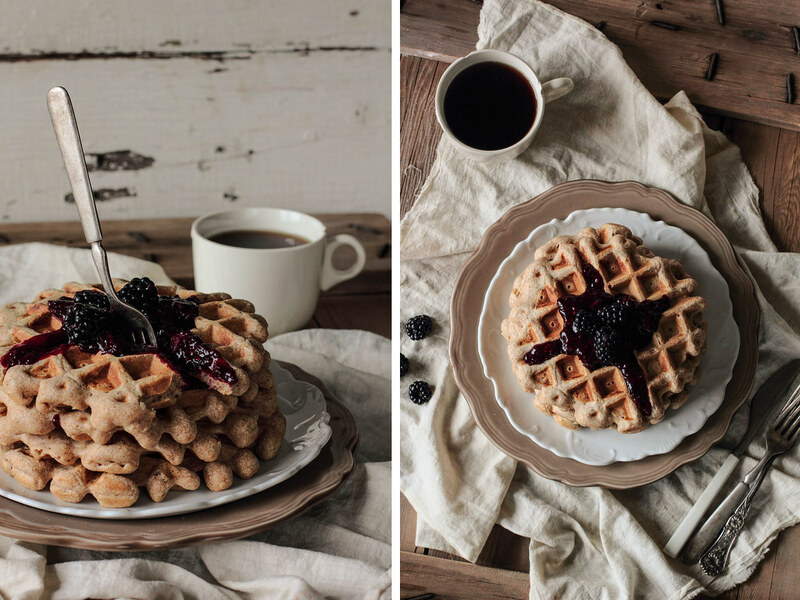 A scattering of chocolate chips brings all the sweetness an early morning needs. It's a common practice, when one is feeling under the weather, to partake in retail therapy. Buying expensive shoes or a new shirt, in those moody moments, makes the weight of the world seem a little lighter. It's hard to say exactly why spending loose change can turn a mood from blue to bright. For some reason, it's easier to face the world with a cheery face when you're working a new pair of blue jeans. Whenever my mood is headed toward melancholy, I like to go food prop shopping. I doubt you will find anyone get more excited about dirty, thrift store silverware than me. Thrift stores and yard sales are the holy grail of food prop shopping. Not only is everything exceptionally inexpensive (as a young woman, extra cash is something I do not have), but the kitchen tools and dinnerware are each a unique find. Certainly this type of shopping can be the definition of hit-or-miss, but when you stumble across something you didn't know you'd been searching for, the union feels fated. I've recently been caught up in old bakeware. Scratched and blackened, only years of dedicated cookie making could have turned these baking sheets into the perfect state of used. Old jam jars become glasses for milk and vases for stray wildflowers. Glass candle holders become cups for serving puddings or containers for jam. Though I have an entire closet filled with baking gear and food props, I find myself using the same things over and over again. The old cotton sugar sack in the photos above is used so often, you could easily spot it in every other post (go play a game of I Spy—I wish I was joking). 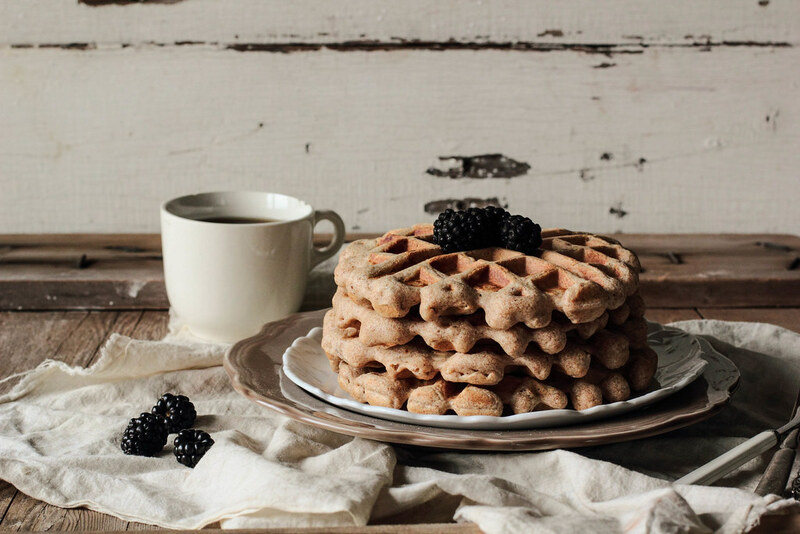 The white rimmed plate holding the honey cake is another find that frequents the pages of this blog whenever a slice of cake or a stack of cookies need to be held. Lately I've been wondering why all my photographs seem to look the same. I think I have my answer. 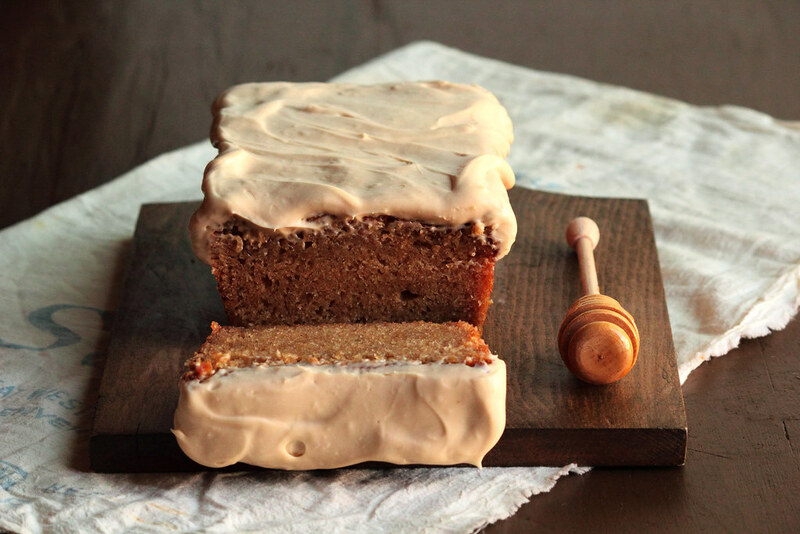 This Honey Wheat Pound Cake with Cream Cheese Icing is a real treat. 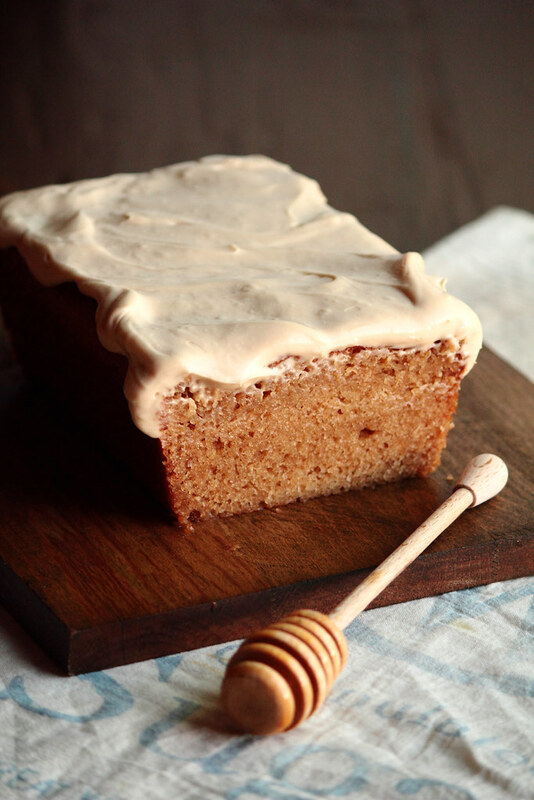 The cake is a simple one, made with part whole wheat flour, buttermilk, and honey. 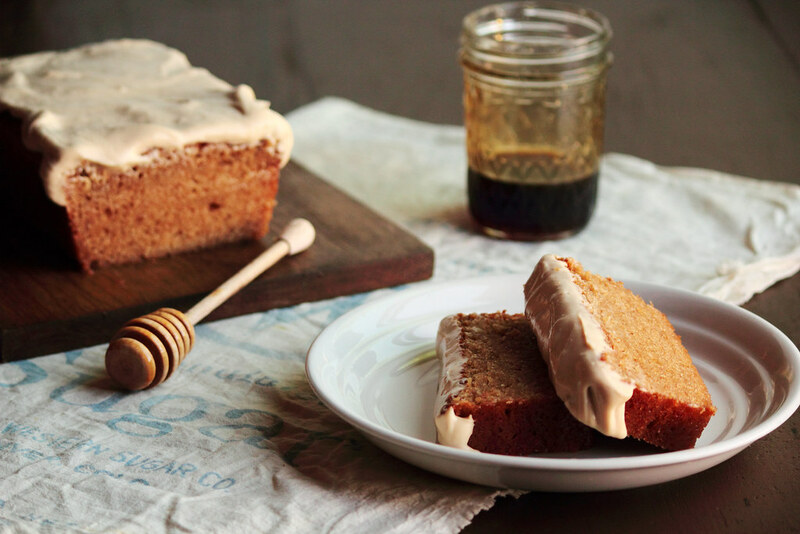 The honey, however, turns this cake into magic when it hits the oven, caramelizing on the bottom and sides of the pan. 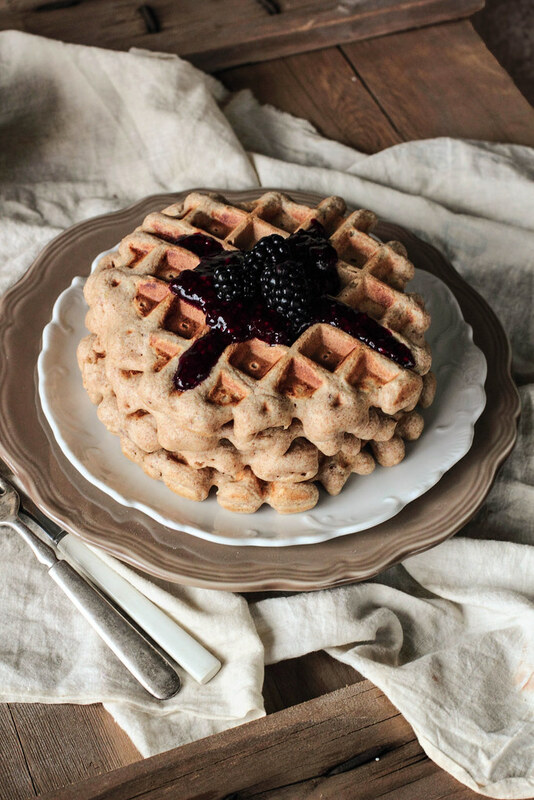 Topped with a honey sweetened cream cheese icing, I found myself eating this cake for breakfast and lunch. 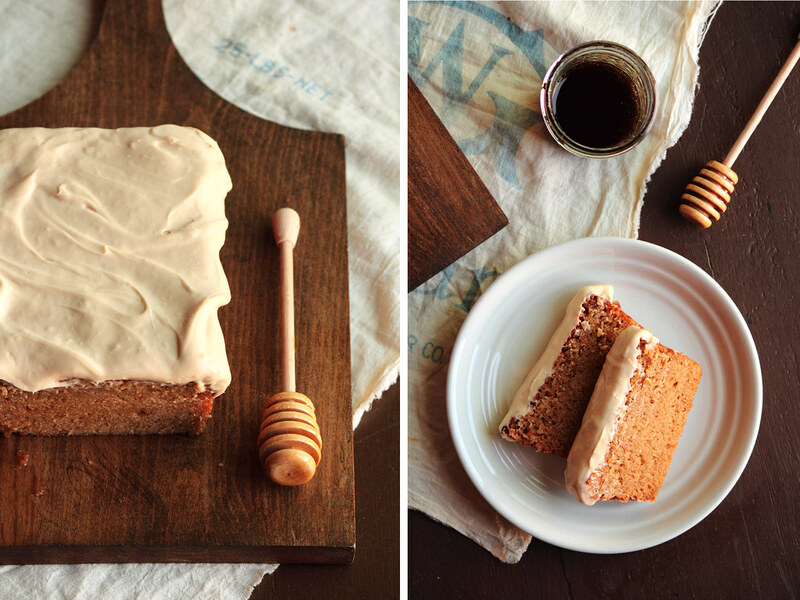 I used a dark honey for this cake and I suggest you do the same to get a deep caramelized flavor. 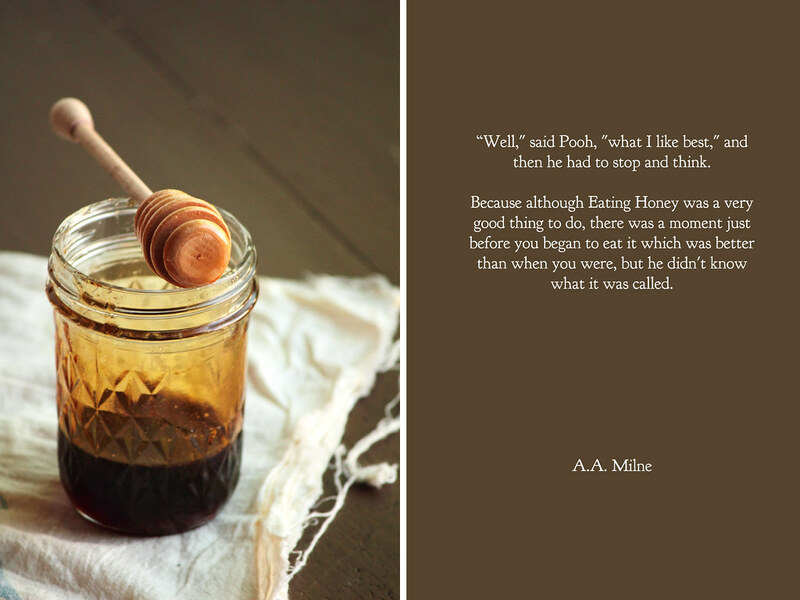 However, if dark honey isn't available, regular honey will work just fine.